I convert everything into two formats, MKV and MP4. So, in this article, I will throw a quick tutorial up on how to convert Blu-ray, DVD movies to MKV, MP4 format playback without losing quality. 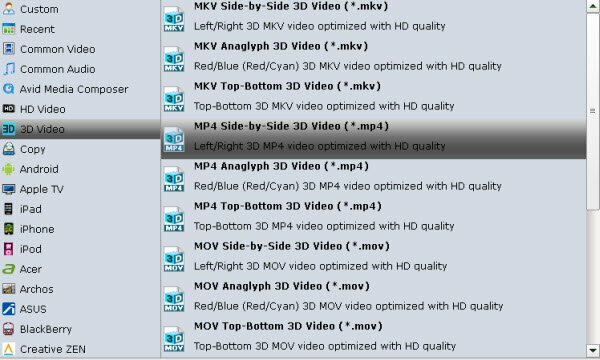 Well, to finish the task, which one is the best Blu-ray or DVD Ripper? There are many Blu-ray Ripper programs claims to do the Blu-ray disc copying and ripping job. It can be a great challenge for you to find the best one on your own, after a lot of online testing and comparison, i finally choose Brorsoft Blu-ray Ripper. It is a professional and powerful all-in-one Blu-ray/DVD disc handling tool, integrating DVD/Blu-ray Ripping, Conversion, and Backup. With decent decrypting capability, high quality video output, considerate backup solution and specific format templates for versatile PMP devices (iPad, iPhone, Apple TV, Xbox, PS3, Android. Windows RT/Pro tablets and phones, etc), Brorsoft Blu-ray Ripper ranks top on the Blu-ray ripping application list. The equivalent Mac version is Brorsoft Blu-ray Ripper for Mac, which can rip and convert Blu-ray movies to MP4, MKV, MOV, AVI, WMV, FLV, MPEG, M4V on Mac OS X (including OS X 10.6, 10.7, 10.8 Mountain Lion, 10.9 Mavericks, 10.10 Yosemite, 10.11 El Capitan, and 10.12 macOS Sierra). Just get it now and follow the steps below to convert Blu-ray discs to MP4/MKV or other formats. Besides DVD and Blu-ray , if you wanna to convert some digital files such as VOB , MKV , MP4, MOV , FLV files to other formats, the all-in-one Video Converter Ultimate program will a nice choice for you. It is a yet professional all-in-one Blu-ray Ripper, DVD Ripper and HD Video Converter, which comparatively has better output quality, in particular HD videos and intuitive interface. What’s more, its deinterlacing function and merging, cropping, trimming, adding subtitles ability are what its many competitive products lack of. If you are Mac users, please turn to iMedia Converter for Mac. Step 1. Insert the Blu-ray disc into external Blu-ray drive and launch the Blu-ray ripper. Click disc button to add the Blu-ray files. At the bottom, you can select your desired subtitle and audio track. And by clicking Edit, you can trim, crop videos, adjust video effects, add watermarks, etc. Note: It is not only a Blu-ray Ripper, but also work well with DVDs, just like the Blu-ray Player can work with DVD disc well. Step 2: Click the Format bar and go to the Profile column, choose MKV as the output video format in the category of “Common Video”. Step 3: Click the “Settings” icon, and you can adjust codec, bit rate, frame rate, sample rate and audio channel in the interface according to your needs and optimize the output file quality. Step 4: Press the big “Convert” button at the bottom of the main interface to convert Blu-ray to MKV, MP4. You’ve made it. This professional Blu-ray Converter really never lets you down during the work. After the conversion, get the MKV, MP4 outputs to play on your computer or stream to kinds of media devices for playback at ease.